nowTV Pack Add-On – $10/mo. Primary Cantonese language TV packages. *Base DISH programming package required. Cantonese: Gem Pack – $19.99/mo. Enjoy a variety of best Cantonese TV programs with Cantonese Gem Pack. Watch your favorite entertainment shows, news, and movies from the popular Cantonese channels in both China and Hong Kong. Channels include NOW International, Now Chinese Drama, Sky Link 2, Phoenix Hong Kong Channel, Star Chinese Movies 2, Guangdong Southern TV, and Shenzhen. To order the Cantonese: Gem Pack, contact your DISH International representative today. 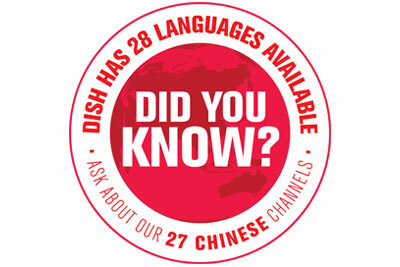 The Cantonese: Jadeworld Pack is a brand new international programming package exclusively on DISH! It offers five channels of popular programming from Mainland China, Hong Kong and Taiwan – entertainment and informational programming for every member of the family: news, entertainment, music, lifestyle, children’s programming and more. To order the Cantonese: Jadeworld Pack, contact your DISH International representative today. Cantonese channel add-on packs. *International base and primary international channel package required. Cantonese: nowTV Pack (Add-On) – $10/mo. The add-on Cantonese: nowTV Pack includes three popular channels from Hong Kong featuring entertainment programming, 24-hour financial news and more. The now TV International channel – available in HD – covers contemporary lifestyle from Hong Kong, China and Taiwan. The now BNC channel provides insightful analysis, and the now HaiRun channel features critically acclaimed drama. To order the Cantonese: nowTV Pack (Add-On), contact your DISH International representative today.